The British architect's Shanghai-based studio designed the museum as the centrepiece of a new cultural district in the county of Anji. The museum is currently under construction and set to open later this year. Pavilions are rendered in red ochre to match the clay earth of the hillside. They are topped with green roofs to complement the surrounding nature when viewed from above. At the northernmost point of the site, an enormous loggia intended to recall medieval cloisters welcomes visitors to an entrance pavilion, which looks out towards the exhibition halls and the landscape beyond. The building consists of eight single-storey pavilions, which are partially embedded in the sloping earth. The large, monolithic volumes contain public areas and exhibition spaces positioned around the central garden. "The large visitor numbers expected, combined with the scale of some of the exhibits, gave rise to a loose infrastructure of generous circulation and spacious exhibition halls," explained the studio. "Set at right angles to the slope and staggered horizontally, the pavilions follow the natural topography," the studio added, "negotiating a 12-metre difference in height from north to south, and minimising the impact on the landscape." The loggia continues around the perimeter of the central garden, providing continuous circulation connecting the other pavilions. Visitors can also move between the exhibition halls by crossing the central garden. The southernmost pavilion contains education facilities and looks out toward a lake at the bottom of the site. The garden and landscaping surrounding the building help to further root it in the landscape. The museum was founded in 1929 and has its main site in the city of Hangzhou. This second branch occupies a hillside site in a large park, where it is surrounded by bamboo forest and overlooks rice fields in a valley below. Many important discoveries from the Cretaceous period have been unearthed in the eastern province of Zhejiang, and the museum's collection numbers over 200,000 geological, ecological and paleontological specimens. David Chipperfield Architects has worked on numerous cultural projects, including an extension to London's Royal Academy of Arts and a colonnaded entrance building on Berlin's Museum Island. 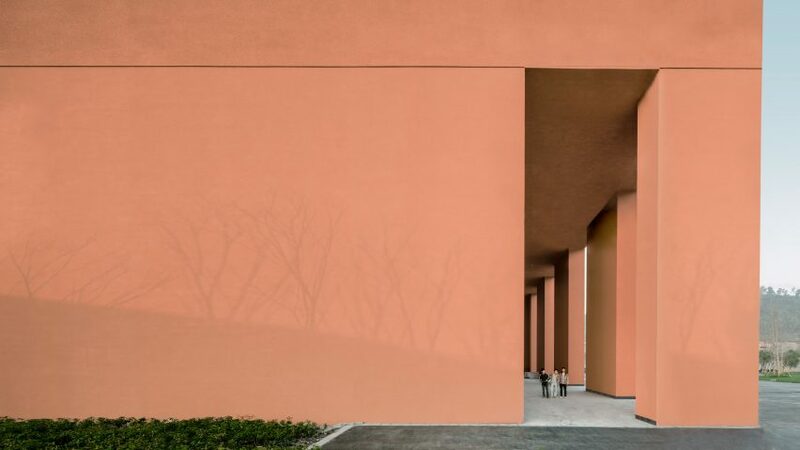 The practice also recently collaborated with Karakusevic Carson on a pair of hexagonal residential towers in east London, and unveiled a pink pigmented concrete visitor centre and chapel at a Japanese cemetery.